Have you ever been in an emergency situation where you were unable to wash clothes for your family? Power failures seem to happen every day, whether caused by grid overload, wind, weather, fire, earthquake, or flood. Sometimes these power failures start feeling like a regular part of life. However, when it is something as simple as washing clothes, this calamity can come from something as simple as a broken washing machine. While you’re waiting for repairs, you might find it helpful to know how to wash clothes during an emergency, so that you and your family can have access to clean clothes. Alternatively, some people don’t have their own washer and dryer (like apartment-dwellers) and depend upon a coin-operated laundry room or a Laundromat. Anyone who has ever been part of one of those washer-less families knows how it feels when you’re out of quarters and trying to wash out a few things in the sink. That’s one of those times when you need a better method for how to wash clothes during an emergency. Fortunately, that’s why we were able to find a detailed tutorial that will walk you through the process of making your own portable emergency washer. With these instructions, you will learn a method for washing clothes that really works. All it takes is a little foresight and a few items that you can get at your neighborhood hardware store. You’ll need two buckets, two lids, and a particular type of plunger. You will also need a drill so that you can drill holes and properly construct your homemade emergency washing machine. 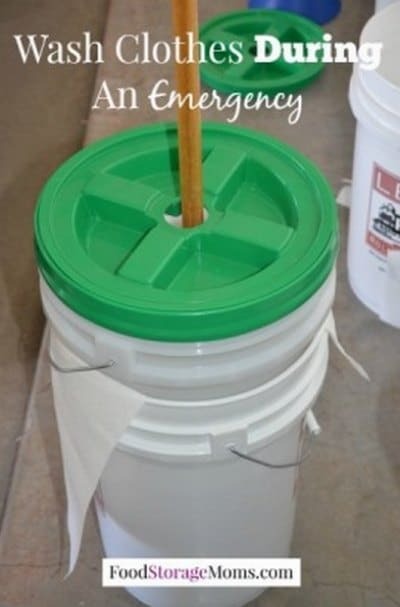 To make the whole process complete, the tutorial also provides you with an excellent recipe for homemade laundry detergent that is compatible with your completely portable emergency washing machine. Overall, the tutorial will provide you with instructions, step-by-step directions, and helpful photos that will show you how to easily wash clothes during an emergency.